Fernando Mendes had the most liked content! Excuse me but I am not believing.1/8" is very thin.Is not it 1/4"? I do not believe yet. Which is this spring(14-14-4) purpose?Is it a compression spring type or decompression type? Meaning for DPCD-AB-920159-L6 on top of radiator? Where I bought my E7T2 remanufactured Carter B&B. That type is that I use since 1987 in my 251.It is a DFV brazilian type.In june I will change for an B&B E7T2 remanufactured I bought. Clutch and brake pedal pads. 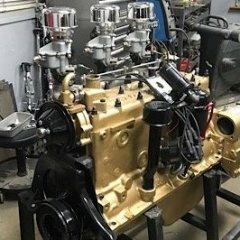 Mine 251 IND Chrysler engine is this Carter fuel pump that I rebuilt all. Generally is from car engines,not trucks engines.